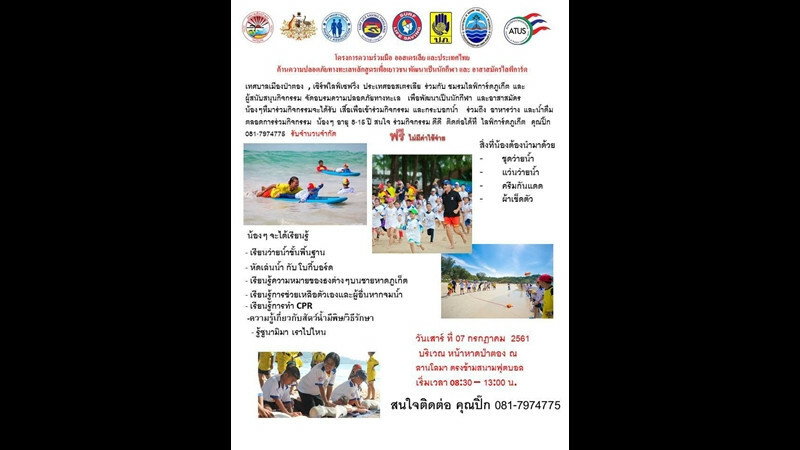 PHUKET: Phuket children aged between 8-15 years old are invited to receive free beach safety training at an activity to be held in Patong on Saturday. The activity, to be held from 8:30-1pm on Saturday (July 7) at Dolphin Court on Patong Beach, is a collaboration between Patong Municipality, Surf Life Saving Australia, Phuket Lifeguard Club and supporters. During the activity kids will be given swimming lessons and basic lifeguard training giving CPR, learn about the various beach warning flags and dangerous sea animals and how to treat their wounds, along with advice on Tsunami evacuation procedures. All kids who take part in the activity will receive T-shirts, bottles, snacks, and drinks. Anyone interested in this activity and call Phuket lifeguard Pik on 081-7974775.